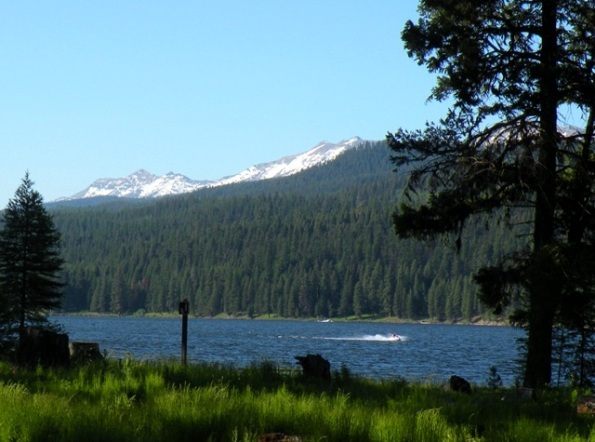 Directions: From the town of Seeley Lake, travel 1 mile north on Montana highway 83. 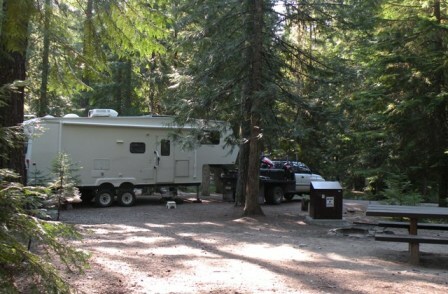 The campground is on the west side of the highway. Season/Month I Observed: mid summer Weather I experienced It's always been warm though summer thunderstorms are often a nice break. There is a Dump station in The parking lot of Lindey's Steak House in Seeley lake $5 fee. There is also a state dump station at the rest area slightly east of the intersection of Hwy 200 and Hwy 83 if you are coming from the south, and a Forest svc. Dump station at Holland Lake several miles to the north if you are approaching from or leaving in that direction. This camp gets heavy useage from the local Montana residents boating on the lake. If you want to settle in here I'd advise early to mid week arrival and get there as early in the day as possible. Finding a campsite, in the summer, if you arrive later then Thursday Morning is pretty iffy. Directions: From the town of Seeley Lake, travel 9 miles north on Montana highway 83 To National Forest Road FR 552 on the west side of the highway. Drive in .3 of a mile, just across a narrow bridge. The access to the campsite is immediately on your left. Season/Month I Observed: mid summer Weather I experienced It's always been warm thoughsummer thunderstorms are often a nice break. The Clearwater River flows just past the camp, just to the right out of the picture. It's a beautiful nice camp. Usage seemed pretty active, especially on weekends. 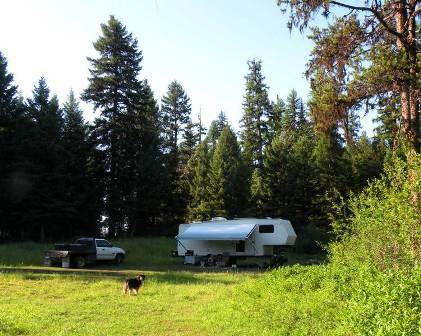 To use this camp you'll want to try to occupy it early to mid week. Later than that and you'll risk it being taken. Rig Size Limitations: Our 30' fifth wheel just fit in. I believe a couple feet longer could squeeze in, but then it gets pretty tight. Cell Signal: NO Cell Signal until Near the Idaho Border at the Cabinet Gorge Damn area. Directions: The Bad Medicine Campground is located 25 miles south of Troy on Hwy 56 or 16 miles north of Hwy 200 from just east of Heron. How I found This Camp: Searching on the Montana state map showed a camp area, and then we just watched for signs. Back in Libby, or on across the line into Idaho. Up in Libby is all I know of for sure. There is zero cell service here. We didn't start picking up any service until we crossed over the ridge at Cabinet Gorge Damn. Be sure to go walk the trail back toward Hwy 56 at Ross Creek Giant Cedars! A quiet camp, though it seemed to almost fill late in the evening with overnighters like ourselves. It sits above Bull Lake which is a nice sized lake along Highway 56. There's a boat ramp at the campground and we saw quite a few fish rising in the morning.